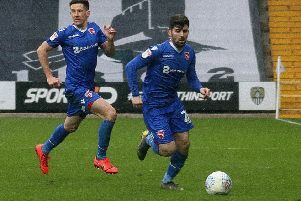 Morecambe boss Jim Bentley says his side’s fate is in their own hands now after picking up seven points from nine this week. Home wins against Forest Green Rovers and MK Dons and a dogged point at bottom club Notts County mean the Shrimps now sit nine points clear of the bottom two with eight games to go. Bentley said: “This week has been a really good one and to take seven points from three tough games has been a fantastic confidence booster for everyone. “It has put us past the 40-point mark which is always a good milestone and has given us a bit of a cushion over the bottom two. “But anyone who knows anything about football knows that there will be twists and turns between now and the end of the season and we have to make sure we don’t take our foot off the gas at any time. “It only takes a couple of poor results to see you lose the advantage you have worked hard to get and we know we need to take it game by game and make sure we are up for every game. “The great thing is that things are in our own hands and we need to take confidence from that, starting at Swindon on Saturday. The Shrimps had gone into the game of impressive wins against Forest Green and MK Dons teams needing points in their bid for promotion. 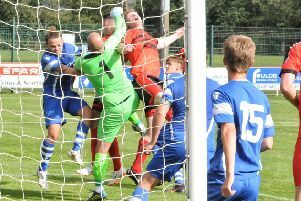 Saturday’s match also saw Bentley’s players up against a side needing the points for different reasons in their fight to avoid the drop. Bentley had spoken in the build-up to the game about not taking their lowly league position for granted and admitted a point was a good result. He said: “You’ve got to be happy overall, away from home, at a difficult place. “We’d have probably taken a point before the game; it’s important after having two good home wins, scoring seven goals like we have, that we kept that momentum high. “Conditions weren’t great; both sets of players were very competitive and there were plenty of tackles early doors. “At this stage of the season, it can throw up freak results but it was important we didn’t lose the game with regards to where both clubs are and the week we’ve had. “There wasn’t much free-flowing football or chances at either end; it was a dour game but quite competitive. “It looked like both sets of players were quite nervous; they started a little bit better than us and the crowd were behind them.